When I set up for this photo I had no intentions of having any people in the shot. I just wanted to get the sign and the building in the frame. I was all set up and waiting for a bunch of cars to go by so I could capture all the lights. These 3 girls walked up and where waiting for the light to change. I was making some adjustments and snapping a few pictures. The girl with the ice cream asked if I was snapping pictures of them, because they could pose. I laughed and said I was just interested in the sign. However, after l got home and looked at the test shots with the girls, I liked that one better than the one with the car lights. So as it turns out I guess I was taking their picture haha. PS: That’s my buddy Allen in the bottom left of the photo haha. He was shooting his own photo. Actually I ended up shooting a photo in that exact same spot with that ball of his on the rail. I’ll post that picture next. 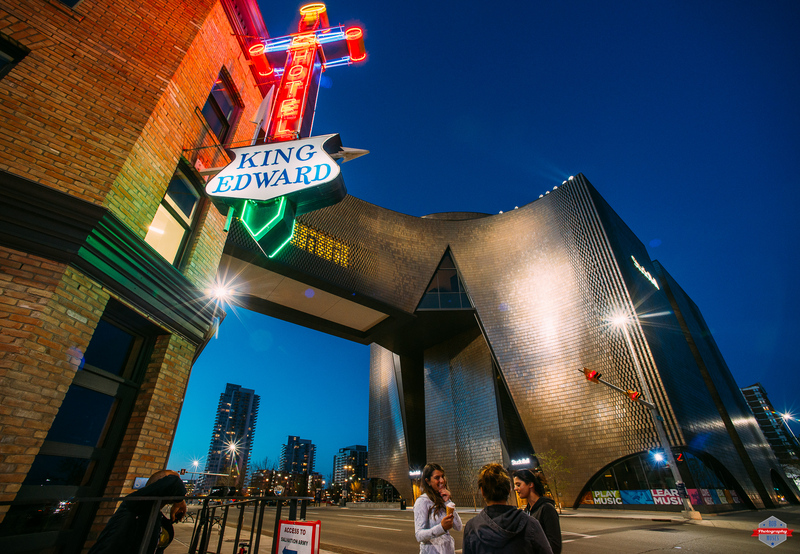 This entry was posted in Architecture, Cities, People and tagged 14mm, Alberta, apartments, architecture, bar, beautiful, Bell, big city, buildings, Calgary, Canada, city, City Life, condos, D800, D800E, downtown, dusk, East Village, explore, girl, girls, historic, hotel, ice cream, inner city, King Edward, lights, long exposure, metro, modern, music, neon, new, night, night life, Nikon, old, photo, Photography, pretty, prime, Sign, sky, Skyline, skyscraper, skyscrapers, street, uptown, Urban, windows, yyc. Bookmark the permalink. yes, I find I have photos that are much better with people in them.